Kellogg Company was named among the world’s Best Regarded Global 2000 Companies, as per the second annual Forbes magazine ranking. Ranked at No. 13, Kellogg has risen an incredible 219 spots from its previous position on the 2017 list. This morning, Kellogg Company was named among the world’s Best Regarded Global 2000 Companies, as per the second annual Forbes magazine ranking. Ranked at No. 13, Kellogg has risen an incredible 219 spots from its previous position on the 2017 list and is the highest ranking food company on the 2018 list. To compile this list, Forbes partnered with Statista, who surveyed 15,000 people from 60 countries. 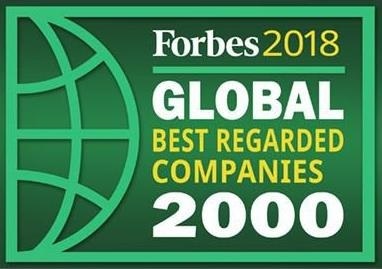 These respondents were asked their opinions about the 2018 Forbes Global 2000 companies. Companies were evaluated on topics such as trustworthiness, social conduct, performance of the company’s product or service and the company as an employer. The full list of companies can be found here. Notably, this recognition comes on the heels of several others for Kellogg in 2018, including a 15-spot improvement on Forbes Most Reputable Companies list, a 17-spot improvement in Harris Poll’s Most Visible Companies in America list and 10-spot improvement in DiversityInc’s Top 50 Companies for Diversity. Kellogg’s in India is a pioneering breakfast cereal brand and it offers foods under ‘ready-to-eat’ cereals and ‘hot breakfast’ categories. Known for its flagship brand Kellogg’s Corn Flakes®, positioned to all members of the family, other loved brands include Kellogg’s CHOCOS®, Kellogg’s Honey Loops, Kellogg’s Special K®, Kellogg’s All Bran® Wheat Flakes, Kellogg’s Muesli and Kellogg’s Oat-bites. It’s hot breakfast portfolio includes Kellogg’s Oats which is available in both, plain and flavored variants. Kellogg also forayed into snacks by introducing Pringles® in India. Kellogg’s growth in India has been guided by the company’s purpose of nourishing families so they can flourish and thrive. As a part of this belief, Kellogg India champions the importance of breakfast to ensure a great start to the day, highlighting the benefits of cereal as a part of a balanced breakfast. To learn more about our responsible business leadership, foods that delight and how we strive to make a difference in our communities around the world, visit www.kelloggcompany.com. For Kellogg India specific information, visit www.kelloggs.in.